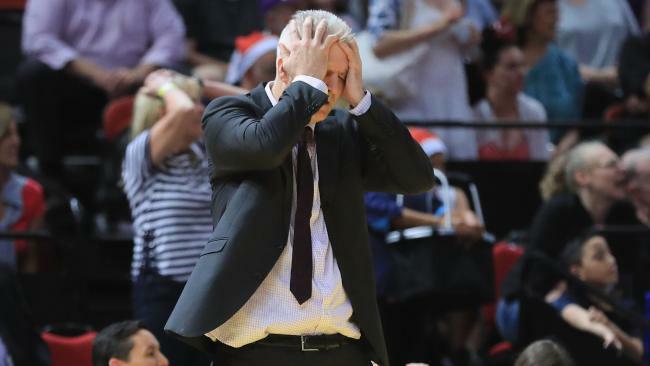 Kings Coach Andrew Gaze is under serious pressure to deliver a title. 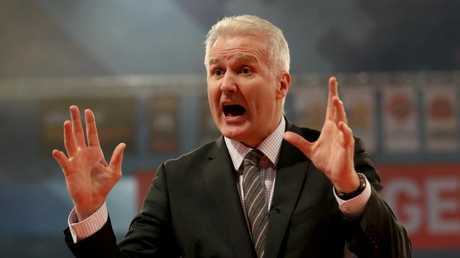 THEY'VE got all the pieces in place, now Sydney Kings coach Andrew Gaze just hopes they "don't stuff it up". 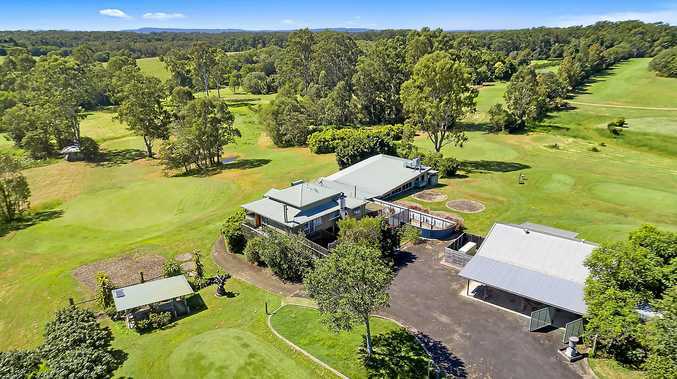 It was a classic line from the former Boomers great, who will be the man under the most pressure since the NBL club's acquisition of star centre Andrew Bogut. An NBA championship winner in 2015 with Golden State Warriors, the Melbourne native's addition has been touted as the biggest signing in league history. Bogut joins former league MVPs Jerome Randle and Kevin Lisch and fellow Australian veteran Brad Newley in a mouth-watering line-up that could still feature another two imports. NBL owner Larry Kestelman is already certain the club will form the greatest starting five in NBL history. All of that isn't lost on Gaze who is in the final season of a three-year contract and knows it's all or nothing as the club seeks its first title since 2005. The Kings have wallowed in the bottom quarter of the eight-team competition for the last two seasons, with a superior big man a notable absence until now. "It comes with the territory; when you make a signing like this it does have a huge impact," Gaze said of the pressure. "That missing piece has been what's happening in the middle - we've solved that and deserve to be contenders for a title. "Hopefully we don't stuff it up." 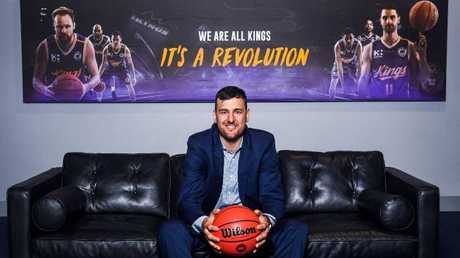 Bogut, 33, is adamant he isn't just playing to fill stadiums and said his goal would be to score and rebound in double digits when the season begins in October. The Kings shot from $6.50 into $3.50 favourites once news of Bogut's signing broke but Gaze knows it won't be a case of just having to turn up. "Right now Melbourne United and Adelaide 36ers ... we'll go in with the perception that we've got more talent but gee whiz they're outstanding teams and, along with Perth and New Zealand, what they're doing is extraordinary," he said. 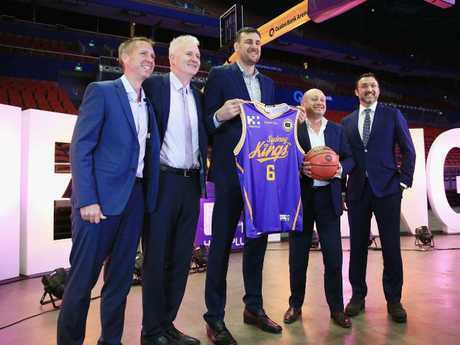 Kestelman says the league has gone global with the signing of the NBA championship-winner and expects more Australian stars to return home. Kestelman, who bought the league for $7 million in 2015, said he was always confident he could attract the big name stars back Down Under. Andrew Bogut is officially unveiled. "We put rules in to give clubs incentives to sign Australians to come back. I knew eventually one of the NBA guys would come back," he said. "It was on us to set up the right platform for them to be able to do it." The illustrious signing comes fresh on the heels of the New Zealand Breakers being sold to a consortium containing ex-NBA stars Matt Walsh and Shawn Marion. "We're now a global league and there is interest coming all around the world," Kestelman said. "They're Australians, they're proud, they want to give back and they want to play in front of their families."